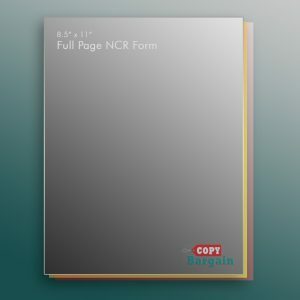 NCR forms are carbonless, so the top copy is always duplicated as it is written. This feature is essential for invoices, quotes, and other business forms. This type of form can also protect your business from unauthorized changes made to a document. The form can be customized with your business logo and additional relevant information that you wish to include. It is a convenient way to create multiple copies of an agreement or quote, and it adds a sense of professionalism to all of your formal business transactions. There are several benefits to using carbonless paper. Speed is one benefit. Carbonless paper permits users to make multiple copies of business contracts, invoices, receipts, and other forms as soon as they are written. Carbonless paper allows you to place essential details on every copy simultaneously for better accuracy. When each copy has to be handwritten, transcription errors are always a possibility as a result of skipping or overlooking words. But because carbonless paper allows for seamless transfer, you can be assured of a precise transcription every time. 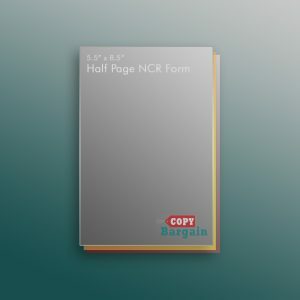 Each page is conveniently color-coded, so you can easily keep track of who receives which copy, and with Copy Bargain’s custom templates and designs, you can ensure that every page is an ideal reflection of your unique brand. These forms are cost-effective, and each order is tailored to the customer. When it comes to your business, you should never have to settle for second best. Copy Bargain is here to make your life easier with stunning, professionally printed NCR forms that are shipped directly to you in record time. We dedicate ourselves to providing the finest made-to-order printing, fair prices, and exemplary customer service that will enhance your business to its full potential. We are veteran marketing professionals who understand the importance of having duplicate documentation that looks great and protects your interests. Need help with the design or arrangement or your NCR form? No problem. Our designers and print experts are available and ready to assist you. Whether you need professional assistance with choosing the best print material or you just need a quick turnaround for an important company deadline, we’ve got you covered.